The Honda Racing Team will compete in next year’s championship as a full ‘works’ entry, and will continue a successful partnership with the West Midlands-based Team Dynamics, with whom Honda won the 2010 Manufacturers’ title. To meet the revised 2011 regulations, a new, more-powerful Honda Civic will race for the championship, and Team Dynamics and Neil Brown Engineering have already begun to develop a turbo-charged Honda engine for the challenge. 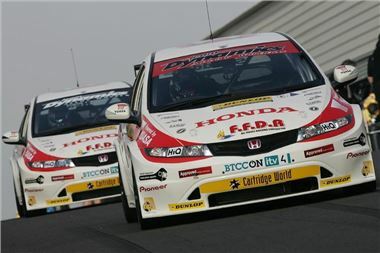 It’s been a successful 2010 for Honda in the BTCC, with the team racing to 22 podiums and 5 wins each for drivers Matt Neal and Gordon Shedden. They go into the final rounds at Brands Hatch this weekend in first place in the team standings, and with both its drivers in with a shout of taking the championship. Steve Neal, Team Principal of Team Dynamics said: “We are really pleased that Honda is giving us the opportunity to continue to run their team in the 2011 BTCC. To gain the endorsement of Honda is testament to the hard work put in by our team and, of course, the results achieved. We know that results matter and expect to be challenging for championship honours once again next season. “We know we have a beautifully balanced car in the Civic and the race engineering 'know how' to maximise the benefit of the extra power the new regulations bring,” Neal continued. Drivers and sponsors for 2011 will be announced over the coming months.